A teenaged Frederick Douglass (Giovanni Adams) is not sure he wants to buy what Donald Rumsfeld (David Sinaiko) is selling in Cutting Ball’s world premiere production of Andrew Saito’s “Mount Misery.” Photo Credit: Cutting Ball Theater. The irony of Rumsfeld’s purchase did not go unnoticed. And so it is, that a few years later, in 2011, playwright Andrew Saito came to suggest to Cutting Ball’s artistic director, Rob Melrose, that this peculiar historical overlap of the slave Douglass, the slave breaker Covey, and the torture enthusiast Rumsfeld would make a good play. The idea of an encounter between Rumsfeld and Douglas might suggest a traditional play of ideas, along the lines of a debate, with the two men of history exchanging measured arguments, presented by costumed actors, in a proper historical drama, very educational, very masterpiece theatre, not quite dull but not quite bristling with life either. Saito had a better idea. He imagined the Rumsfeld’s (Donald and wife Joyce) as encountering the ghosts of the teenage Douglass and the slaveholder Covey without knowing who they are. And treating the whole thing as a sort of surrealist comedy, a blithe, spirited play about the happy subjects of torture and slavery and how they lead to true freedom. The result is funny, shocking, thought provoking, brilliant, entertaining, and altogether marvelous. It would have been easy to make Rumsfeld into a sort of ignorant monster, but Saito does not take the easy path. This Rumsfeld is no monster, at least not obviously. He’s likable, reasonable, even compassionate, and apparently sincere. The depth of his blindness, his willful denial of fact, his pompous self-righteousness, his smug satisfaction with the status quo are only gradually revealed. As Rumsfeld listens, quite sympathetically, to Douglass’s description of the life of a slave, he responds as if he were listening to a modern young man. He doesn’t grasp the reality of the boy’s condition. Gradually, it will dawn on the viewer, that the boy’s condition as a slave is really not that different from that of a modern Black teenager, in many important details. It is a shocking revelation, one which we discover through the genuine interaction of the two men. This is the best kind of didactic theatre: psychologically sound, rooted in story, dramatically engaging, without rhetorical posturing, but nevertheless making its points with unmistakable clarity. Rumsfeld’s genuine shock at the boy’s condition is juxtaposed with his profound denial of his own complicity in torture and inhumanity. The sheer astounding blindness of the man is played for laughs — disturbing laughs, indeed, but truly funny. The other two characters, slaveholder Covey and wife Joyce are also presented with insightful sympathy. Covey, like Rumsfeld, is blind to his own perfidy. When Joyce meets Covey, she finds him completely charming. She can’t see past their commonality — how could this man be evil? — any more than she can see past her husband’s personal charm. She simply denies the evidence right in front of her nose, withdrawing into a pseudo spirituality of new age evangelical superstition. It’s all very funny, but also very horrifying as we are forced to see past the facade to the realities of slavery, torture, colonialism, inhumanity, denial, self service, and genocide. In the course of the play, these themes are presented both seriously and comically, as realism and surrealism, as factual and absurd. The piece is nothing if not post modern. All of the performers are excellent and well directed by Rob Melrose, and supported by superior design elements. A special treat in this production is seeing David Sinaiko as Rumsfeld. Regular attendees at the Cutting Ball will recall Sinaiko’s star turn as Father Ubu in Alfred Jarry’s absurdist masterpiece, “Ubo Roi.” The juxtaposition of the two characters adds an additional level of irony and insight. It takes a true art theater, such as Cutting Ball, to achieve this kind of resonance. This production is highly recommended. “Mount Misery” plays at The Exit Theatre through June 7. For further information click here. “Mount Misery: A Comedy of Enhanced Interrogations,” a world premeire by Andrew Saito, produced by Cutting Ball Theater. Director: Rob Melrose. Scenic Designer: Michael Locher. Costume Designer Heidi Leigh Hanson. Lighting Designer: Heather Basarab. Sound Designer: Cliff Caruthers. Fight Director: David Maier. Choreographer: Rashad Pridgen. Donald Rumsfield: David Sinaiko. Frederick Douglass: Giovanni Adams. Joyce Rumsfeld: Lorri Holt. Edward Covey: Geoffrey Nolan. 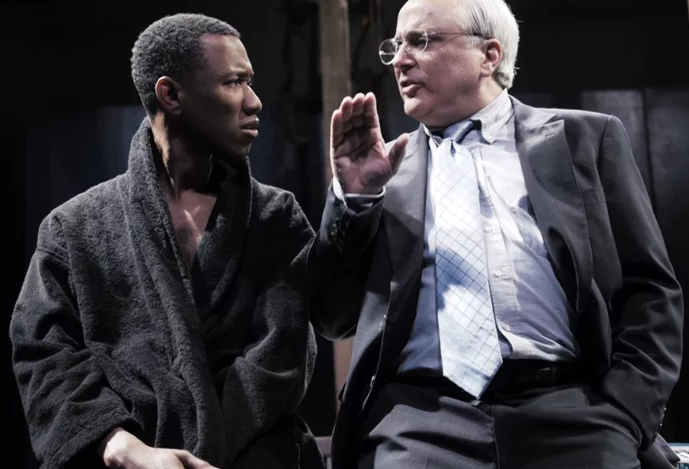 Posted in Reviews.Tagged Andrew Saito, Charles Kruger, Cutting Ball Theater, David Sinaiko, Donald Rumsfeld, Frederick Douglass, Mount Misery, Rob Melrose, theatrestorm.